Proper equipment maintenance is crucial in extending the useful life of any machine. 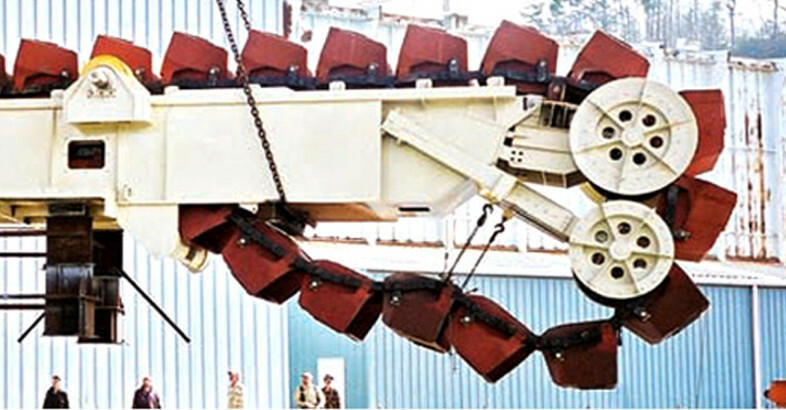 For a continuous barge unloader the maintenance of trolley thrust rollers is paramount to efficient function. Without properly adjusted thrust rollers installed weight is redistributed to other components that are simply not designed to handle them. Thrust rollers are necessary to bare heavy loads. Issues involving trunnion equalizers, rail or wheel flanges are often the result of poorly maintained thrust rollers. Thrust rollers must be properly maintained to avoid a snowball effect of malfunction. Regularly completing a visual inspection of the thrust roller can help to avoid long term damage. Be on the lookout for any side to side motion which would be a telltale sign that there is an issue. It is of utmost importance that the rollers be lubricated regularly. Depending on the machine’s usage level this may be once week, up to daily for machines that run 24/7. Maintaining the integrity of the trolley thrust roller will prevent wear on the flanges of the trolley wheels, wear on the side of the main vertical rail head as well as excessive stress on the trunnion equalizer wheel frames. Basic maintenance will help prolong the life of rails, trunnions, wheels and ultimately the life of the continuous barge unloaders. H&P offers and strongly recommends comprehensive inspections for all continuous barge unloaders. As the Original Equipment Manufacturer, no one understands the machine better or is more qualified than Heyl & Patterson to determine the condition and expected operating life. In addition to this capital equipment, Heyl & Patterson is also a trusted partner after the sale, to cover the complete operational life of customers’ machines. This wide range of services also includes replacement parts and upgrades whether the equipment was purchased from our company or another manufacturer, as well as inspections to maintain operation at peak performance and field service to help extend a machine’s life. Additional literature in the green-branded Bulk Transfer Division line includes CBU Upgrades, Railcar Dumping Systems, Hammermills, Dumper Upgrades and Railcar Movers.